When baby girl had her birthday. Her grandparents had sent her $25.00. They live in another state, so they can't make it to our home. She enjoyed her birthday celebration. I wondered what she'd use her money for. We went to the store and she browsed around and choose a scooter. Of course there were all kinds of scooters at Target. She wanted the ones that did TV things. I reminded her that she only had so much money. So she settled on one that cost $25+ tax. She still loves her scooter. Of course her brother wants to share it. The rest of her money she still has in savings. Gotta teach them how to handle money soon. Oh it is getting lots of use! Ahh the days of being children. Awww Happy Birthday to your little sweetie! A pink scooter oh yes pink is very girlie, but very fun. Bet big brother only rides it in the backyard or when no one is around. hehehe Those wheels look very small Callie. I hope they're sturdy and last a long time. Wouldn't want her heart to get broke. Thanks for stopping by and sharing your darling babies! And yes big brother does ride it in public too :) He isn't scared or care :) Fun is fun right. I love that she found one with pink wheels!! A big happy birthday to her!! Yes. If they could ride it all the time, they would. Both of them. They seem to want to fight over who gets to use it. I wouldn't have chosen it for them, so I'm glad she chose it. I did ask her if she was very sure and she said yes. Now I see they love it, so yes it seems it's a good choice. Happy Birthday to your little girl! 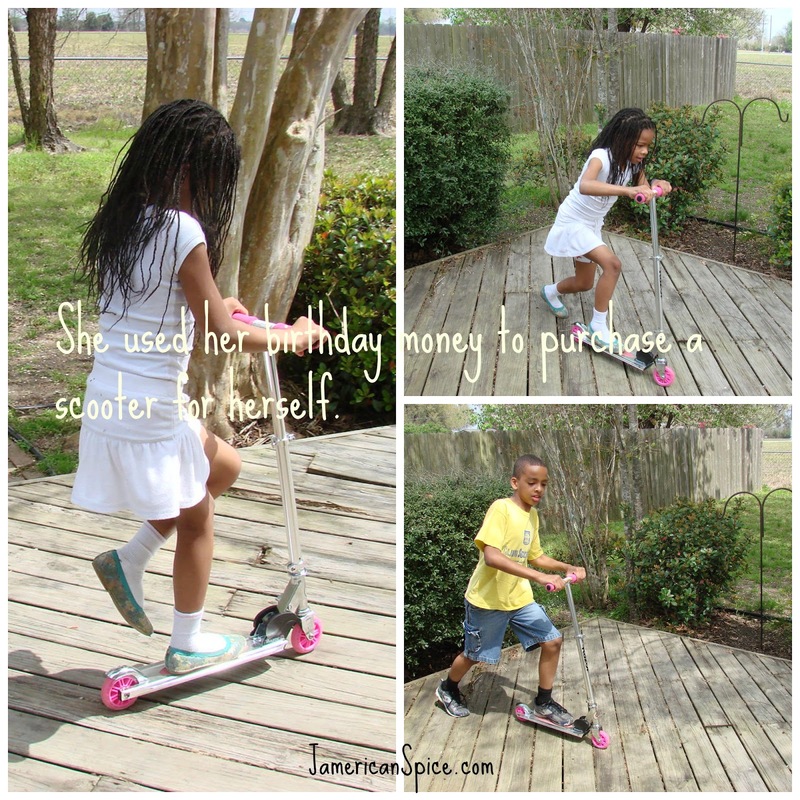 My kids love their scooters. Have a terrific day! We do have to teach them as young as possible, especially in this world right.